20 Jan 2019, 3:50 p.m.
Peter Leonard Henriksen, harpooner, was born in Balsfjord, near Tromsö, in 1859. From childhood he has been a sailor, and from fourteen years old has gone on voyages to the Arctic Sea as harpooner and skipper. In 1888 he was shipwrecked off Novaya Zemlya in the sloop Enigheden, from Christiansund. He is married, and has four children. Peter Henriksen, photograph from Farthest North by Fridtjof Nansen. The extract is lengthy, so I've hidden it behind this cut; click the triangle to expand it. “Then Jacobsen began to hold forth: ‘It’s not at all such an uncommon thing to use skulls for shooting at, either because people fancy them for targets, or because of some other reason; they shoot in through the eyeholes,’ etc., etc. “I asked Peter about ‘Tobiesen’s’ coffin—if it had ever been dug up to find out if it was true that his men had killed him and his son. Chief among the many questions it raised for me, of course, was, "Who was 'Tobiesen', and was he murdered?" The historical record says probably not... but I ran into many other graves on my way to finding it out. 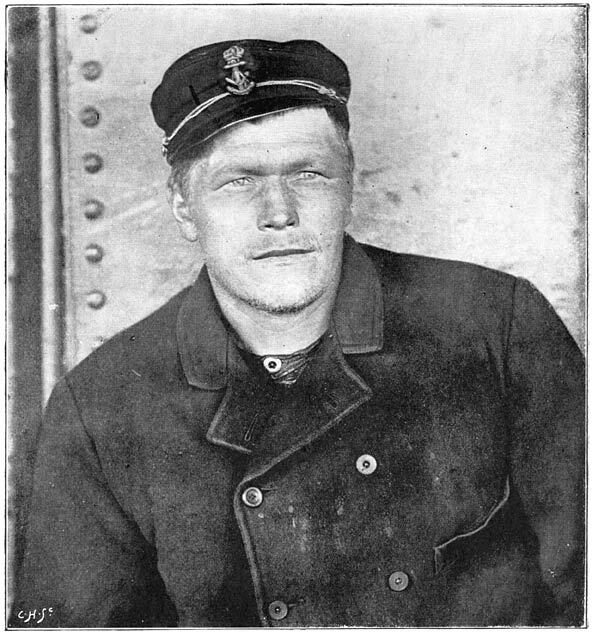 Sivert Kristian Tobiesen was a 19th-century Norwegian whaler, who crossed the Arctic Ocean for the first time as a boy of thirteen, working as a cook on the schooner Alexander. The Alexander's task was to transport seven fishermen to Bjørnøya, or Bear Island, south of Spitsbergen. 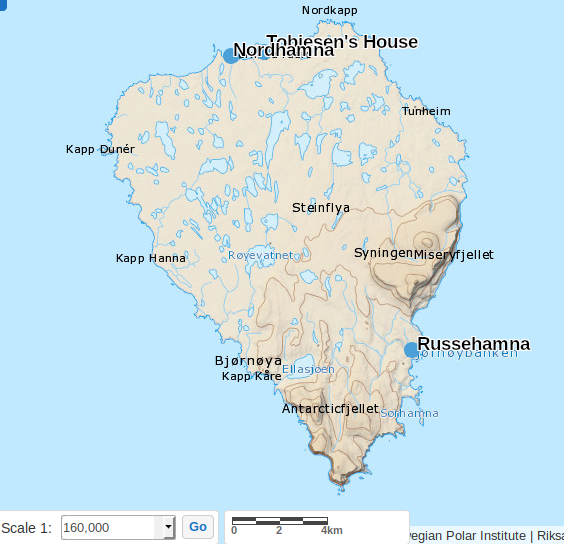 There, in a bay called Russehamna, they were to spend the winter of 1834-5, as they had the previous year. Unfortunately, all seven men died. Tobiesen's career took him whaling in the Pacific and around Svalbard, as well as transporting British soldiers to and from the Crimean War. He learned to hunt seal and walrus in Jan Mayen in 1859, and by 1861 he was able to buy his own ship, the Aeolus, which he took walrus-hunting around Svalbard. In the winter of 1864, the Aeolus was caught in the pack ice in the Hinlopen Strait. They had some luck, in that the renowned explorer A.E. Nordenskiöld was leading an expedition to Spitsbergen (the largest island in the Svalbard archipelago) at the time. After the crew abandoned their ship and rowed around the north coast of the island, they were rescued by the expeditionary group, but they had lost their whole winter's catch. Sivert Kristian Tobiesen, illustration from The Voyage of the Vega round Asia and Europe by A.E. Nordenskiöld. The next year, Tobiesen decided to overwinter on Bjørnøya. He prepared by buying the old Norwegian hut at Russehamna, hoping it would still be serviceable, and also buying a new house that the crew would transport to Bjørnøya and assemble there. 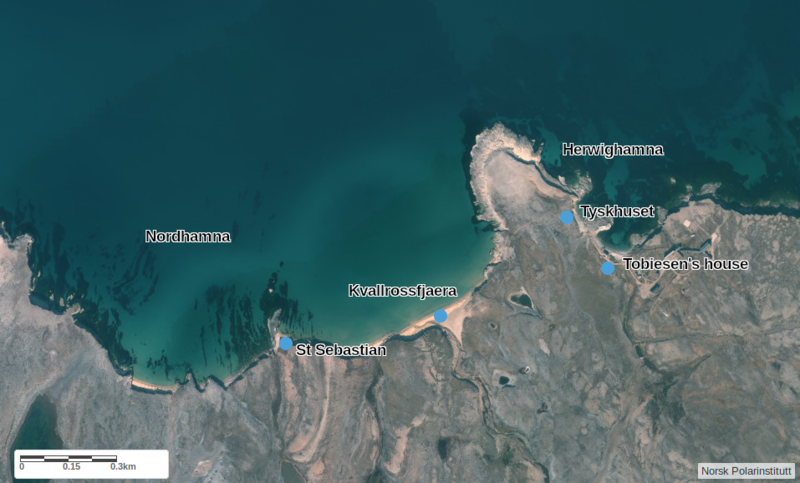 The location he picked was in a small bay called Herwighamna on the north coast of the island. A small hut had been built there in 1822, in which Tobiesen and his crew could stay until the new one was finished. To the east of this spot was a beach called Kvallrossfjaera, walrus beach, because of the huge numbers of the animals that had once thrived there. Map of Bjørnøya, created using the Norwegian Polar Institute's Svabardkartet. West of his house in Nordhamna, TOBIESEN found the remains of at least 11 persons, and he believed they were Russians, killed by the men who were to bring them home so that they might get possession of the catch. Digging up the mass grave, the men counted the jawbones they found within and concluded that there had been 14 bodies. At the bottom of the pit were pieces of charcoal, as though someone had tried to burn the corpses but then given up and filled in the hole. From the remains of clothes found in the grave, Tobiesen was certain that these were the bodies of Pomor hunters or trappers. Pomors, a Russian ethnic group, had hunted walrus on Bjørnøya in the 18th century, though they had stopped coming there by the time of Tobiesen's expeditions. The remains of their huts could be found at Russehamna and also a few minutes' walk further west of the Tobiesen house, in the bay Nordhamna. From a sense of propriety—and simply not wanting to live next to the grave of 14 murder victims—the crew dug up the Russians' bodies and moved them to a new grave, nearer the Russian relics. They filled the old pit with walrus bones from the Kvallrossfjaera beach. Since the time of those old hunters, the walrus population on Bjørnøya's northern coast had plummeted. The men hoped that if they cleared away the bones, more walrus would arrive, but their hopes were unmet: in their whole overwintering, they would be able to shoot only one, plus a few polar bears and about forty foxes. Map of the north coast of Bjørnøya, created using the Norwegian Polar Institute's Svabardkartet. I cannot describe my emotions when I held one of the skulls in my hand. I, who 31 years ago, then a boy of thirteen, was cook on board the same vessel that carried them across, and could still remember the names of every one of them, wondered whose head I had in my hand now. The fishermen's leader had lived the longest, and his body had been taken home to Norway by his brother for burial. Tobiesen's crew could not find the final body; Horn and Orvin remark, "In 1924 we found an old skeleton west of Daudmannsvatnet. Perhaps it may have been one of these winterers." Daudmannsvatnet, incidentally, was named after this discovery: the dead man's lake. At the spot on Nordhamna known as St. Sebastian stands a peculiar monument: a shaky-looking cross made of rusting iron stands on a patch of clifftop, surrounded by four smaller posts with chain strung between them. It's a grave, of course, but whose? One tradition has it that the bodies resting there belong to the tragic shipwreck, in 1938, of a trawler named the St. Sebastian. 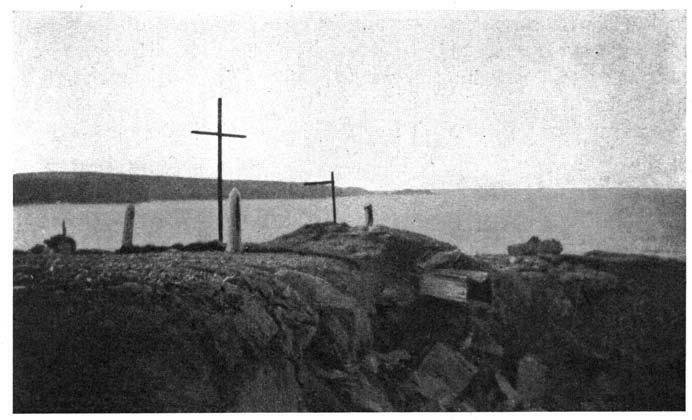 This is decidedly unlikely, however, as Horn and Orvin included a photograph of the site in Geology of Bear Island—in 1924. At that time the cross and posts were already present, and in fact the cliffside had eroded so much since the grave was dug that a coffin was sticking out into thin air. The site in 1924, photograph by Gunnar Horn. Given that remains of Pomor huts are to be found nearby, it might seem obvious that this is the final resting place of the murdered Pomors discovered by Tobiesen. A team of archaeologists who investigated the site in 2015 quickly came to dispute this, though. They believe that Gravodden, the point of land that divides Nordhamna from Herwighamna, would be a more likely location for that. There are already graves dug there, for one thing, and it's nearer to the original site. I haven't been able to find a copy of Tobiesen's diaries online, or even available in print, but from the quotes I've seen, he made no mention either of finding the Pomors in coffins, or of making new coffins for them. The photograph from 1924 thus rules out this hypothesis just as much as the trawler accident. The archaeologists suggest that the cross and posts could have been the work of Captain Abaza of the Russian cruiser Svetlana. It's already known that Abaza travelled in the area in 1899, marking sites of historical Russian significance, which would bolster Russian territorial claims. (This was the same year that the 'Tyskhuset', or German House, was built nearby, for the use of German fishermen.) Abaza also opened a grave in Nordhamna while he was there, recording that he found a skeleton with Russian boots inside. It seems plausible that he might have had it reburied with a new, visibly Russian grave marker. 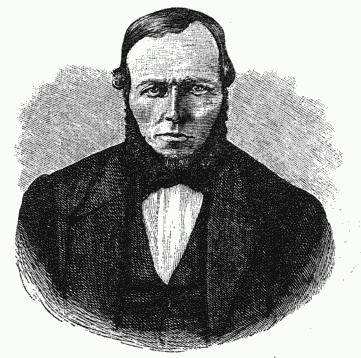 Tobiesen was the first person to make meteorological observations over the winter at Bjørnøya. These observations, as well as his diary, were published by Nordenskiöld in 1870 and earned Tobiesen a medal from the Royal Swedish Academy of Sciences: some compensation for the poor hunting that winter. He spent the next few years hunting and fishing in the Arctic, helping to expand the Norwegian's fishing grounds into the Kara Sea. He also continued to make geographical observations and in 1871, in the hunting vessel Freya, proved for the first time that it was possibe to sail from Spitsbergen to Novaya Zemlya, at latitudes of up to 79° North. Tobiesen, Johan Jacob, the ship's cook and the first mate believed it was too late in the year to try a sea voyage in a small boat. They set up a tent of sails over the Freya's deck and took stock of their provisions: a pitiful amount of food, but plenty of wood on board and on the beach nearby, besides the carcasses of the seals and walruses they had already caught. For a few months, things went fairly well. Curious polar bears often came sniffing up at the beset ship, providing the men with a source of fresh meat. Unfortunately, in January 1873, the bears stopped coming. With only salt meat to eat, the party's health began to decline, and all four eventually got scurvy. Tobiesen became bedridden on February 17 and died on April 29. His son passed away of scurvy on July 5. The remaining men, both ill, had no luck signalling passing ships. In late July, when the ice cleared, they left the site in a fishing boat and were eventually rescued. No one now seems to think so; every source I have seen whilst researching this post repeats that he died of scurvy. Of course, that doesn't mean we can rule it out entirely! Overwintering in Polar regions is stressful in the best of circumstances (as we've previously seen) and—not to be delicate about this—a man already suffering from scurvy would not take much force to kill. Tobiesen and Johan Jacob kept up barometric and meteorological observations as long as they were able. Based on his past behaviour, this means it's likely Tobiesen also kept a diary. This has never been published; it would be interesting to see what he wrote about relations on board, and if that tallies with the accounts of the survivors. I would also love to know just why Nansen and his companions thought that the father and son might have been murdered. Was it just idle gossip, or was there some oddity about the case that roused suspicion? If so, that hasn't been preserved. Without a modern-day Henriksen or Bek (or, ahem, an archaeologist), we may never know what happened for certain. Contains historical details of various other Arctic expeditions, including Tobiesen's. An English summary of one of the Norkark blog posts below. Four blog posts describing the 2015 excavations on Bjørnøya. Angeline20 Jan 2019, 4:36 p.m.This was fascinating! Rae20 Jan 2019, 5:36 p.m.Thank you! I had so much fun pulling on threads to find all of this out.